Reserve this pet friendly casita at our historic bed and breakfast near Tucson in Southern Arizona. Originally built in 1930, The Homestead House at Spirit Tree Inn is an Adobe building, which maintains a good temperature after heated up or cooled down depending on the season. There is a room a/c in the bedroom for summer and two propane wall heaters for winter. 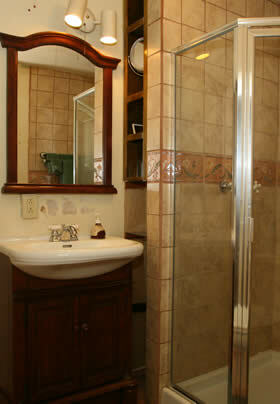 The bathroom was remodeled in 2005 at which time a neo-angle shower was installed. 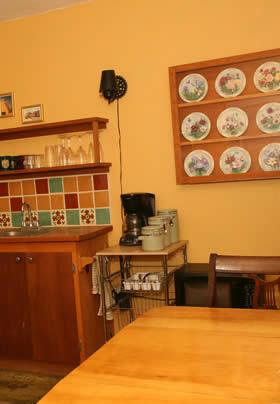 It has a cute kitchenette with microwave, toaster oven, refrigerator/freezer and a two-burner hotplate. There are pots and pans, dishes and flatware, and even a crockpot. The Homestead House is accessed by a bridge across a small ravine that is a runoff area during the monsoons. There also is patio furniture where you can sit and eat outside if you wish. You can request a BBQ grill. This casita is animal friendly.